A roughly circular piece of hammered pewter is topped with a stack of hand cut and polished Bison Horn and a milky Mother of Pearl cabochon bezel set in fine silver on a textured pewter disk. 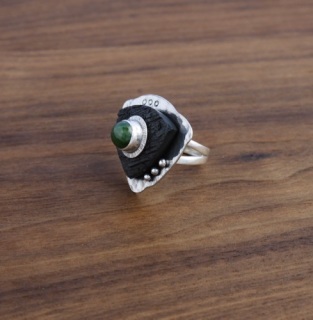 The contrast between the smooth white Mother of Pearl and the textured black color of the Bison Horn is striking! The band is a cast sterling silver split shank size 9. I can do other sizes by request. 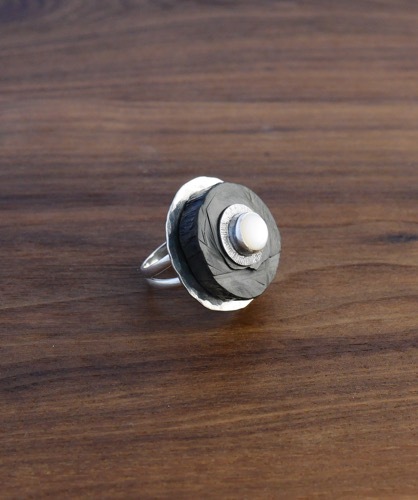 This is a rather large fashion ring with the circle being approximately 1 and 1/8 inches in diameter. I hand cut and polish all my own Bison Horn so each piece is unique. Roughly triangular shaped hammered pewter is topped with a stack of hand cut and polished Bison Horn, and a beautiful Jade cabochon bezel set in fine silver on a textured pewter disk. Hand stamping and cast pewter droplets add interest. The band is a cast sterling silver split shank in a size 9. I can do other sizes by request. This is a rather large fashion ring with each side of the triangle measuring just over 1 inch. 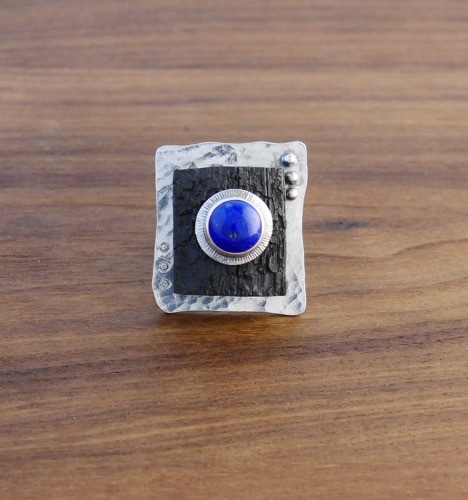 A roughly rectangular piece of hammered pewter is topped with a stack of hand cut and polished Bison Horn and a Lapis Lazuli cabochon bezel set in fine silver on a textured pewter disk. Decorative stamping and cast pewter droplets add interest. The band is a cast sterling silver split shank size 9. I can do other sizes on request. This is a rather large fashion ring with the rectangle measuring approximately 1 and 1/8 inches tall by 1 inch wide. ​I hand cut and polish each piece of Bison Horn so they are each unique.